First base has been a glaring weakness for the Yankees over the last three seasons. Mark Teixeira had his last great season in 2015 — he hit .255/.357/.548 (143 wRC+) with 31 homers in 111 games that year — and Greg Bird helped picked up the slack after Teixeira went down with his shin injury that August. 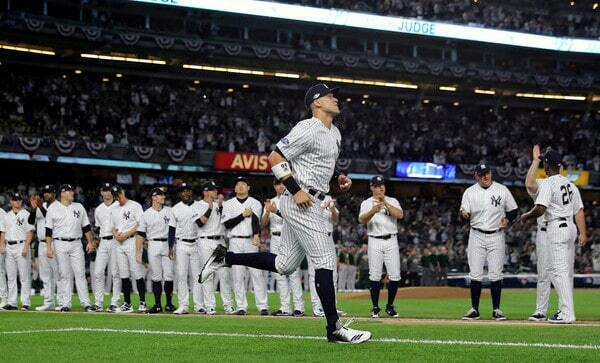 That was the last great year at first base in the Bronx. That is turrible. The league average first baseman hit .259/.339/.459 (112 wRC+) the last three years. Yankees’ first basemen hit like 2018 Ian Desmond (.236/.307/.422) in almost 2,000 plate appearances during that time. This season their first basemen hit .234/.309/.453 (104 wRC+), which is only slightly better than their aggregate 2016-18 output. First base has been a black hole since Teixeira. Bird was expected to man first base this past season but that didn’t work out. He got hurt and didn’t hit when healthy. Backup plan Neil Walker didn’t fare well in part-time duty. Tyler Austin had his moments early in the season, for sure, but his production slipped in May and he was traded in July. The Yankees even had Brandon Drury start two games at first base as they looked for a solution. Enter Luke Voit. Voit effectively replaced Austin as the depth right-handed hitting first baseman — Voit has minor league options remaining beyond 2018 whereas Austin did not, which was a factor in the swap — and he became much more than a depth pickup. 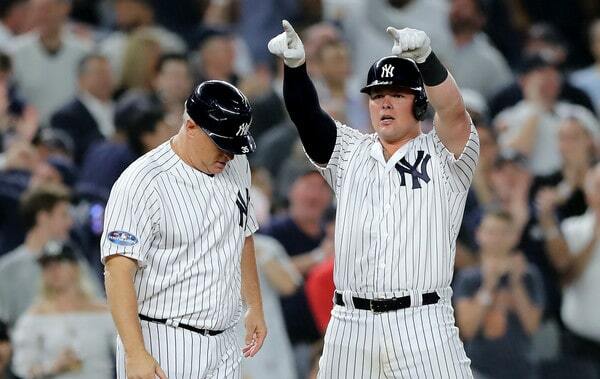 Voit took over as the everyday first baseman in late August and hit .333/.405/.689 (194 wRC+) with 14 homers in 148 plate appearances in pinstripes. What a shot in the arm. Let’s review Voit’s season. The key words there: “last year.” The Yankees had Voit on their radar for some time. Cashman added the team’s analytics department zeroed in on Voit because he hit the ball really freaking hard. In 124 plate appearances with the Cardinals last year, Voit posted a 41.0% hard contact rate and a 7.2% soft contact rate, numbers that are Aaron Judge-ian. His exit velocity (91.3 mph) was quite strong as well. Minor league Trackman data (i.e. Statcast) exists but it is not publicly available. MLB and the 30 teams keep it all in-house, which is a bummer, but I get it. Anyway, that information also contributed to the Yankees pursuing Voit. The Yankees saw that he was hitting the ball hard, hard enough to overcome his weak defense at the position at the bottom of the defensive spectrum, and the fact he’s on the light side of the platoon. He was worth a shot. Prior to the trade Voit hit .299/.391/.500 (135 wRC+) with nine homers in 271 plate appearances at Triple-A, and had gone 2-for-11 (.182) with the Cardinals. Matt Carpenter crushed the ball this season and St. Louis didn’t have a need at first base. Carpenter’s excellence and the presence of Jose Martinez made Voit expendable, and the Yankees pounced. On July 28th, the Yankees sent Chasen Shreve and Gio Gallegos to the Cardinals for Voit and international bonus money. On one hand, the Yankees stuck with Greg Bird way too long this year. He hit .199/.286/.386 (81 wRC+) in 311 plate appearances. Awful. Just awful. On the other hand, if the Yankees hadn’t stuck with Bird that long, they might not have ended up with Voit, and may’ve been worse off overall because they replaced Bird with someone else at midseason. The Yankees initially stuck with Bird after the Voit trade too. Voit went right to Triple-A after the trade. He then resurfaced for a quick five-game cameo in early August before heading back to Triple-A. In the first three and a half weeks after the trade, Voit played five games with the Yankees (3-for-16) and nine games with Triple-A Scranton (9-for-29). Aaron Judge (wrist) and Gary Sanchez (groin) were on the disabled list and had been since prior to the trade deadline, and I was Mad Online the Yankees didn’t do more than add Luke Voit. Inexplicable that Judge and Sanchez were both out and the only bat the Yankees got at the deadline was Luke Voit. Shows what I know. Voit rejoined the Yankees for good in late August, when they went to Miami for a two-game interleague series and wanted an extra bench bat for the National League games. The Legend of Luke Voit began in earnest on August 24th, in the first game of a four-game weekend series in Baltimore. Voit went 3-for-5 with two homers that night. Two days later, he hit another homer. Four days after that, another homer. Two days later Voit started a streak in which he went deep in three consecutive games.
? It wasn’t just the homers either. Voit played 16 games from August 24th through September 9th and he went hitless in only four of those games. One of the four was an 0-for-1 pinch-hitting appearance. Another was an 0-for-1 with two walks game. The dingers and the raw production gave Voit the first base job outright in September and he finished the season with a flourish. He went 4-for-4 with two homers against the Red Sox on September 19th. From that day on, he went 18-for-43 (.419) with seven homers in his final eleven games of the regular season. Voit played with a ton of energy and he was, by no small margin, the most productive hitter traded at the deadline. By the end of the season he was taking regular turns as the No. 3 hitter between Judge and Giancarlo Stanton. Voit of course started the AL Wild Card Game and of course had a hand in the win, driving in two insurance runs with a sixth inning triple that damn near left the ballpark.
? That was a nine-pitch at-bat against Blake Treinen, who had an absurd season and held right-handed batters to a .123/.206/.166 (.171 wOBA) batting line with a 36.0% strikeout rate. Voit fouled away three two-strike pitches until Treinen make a mistake with the slider, and he punished it. His folk hero status had been cemented. We’ve seen plenty of guys do great things in small samples during the regular season (Shelley Duncan, anyone?). Have a moment like that in October though, and it’s hard for the fans to forget you. “This is sustainable. 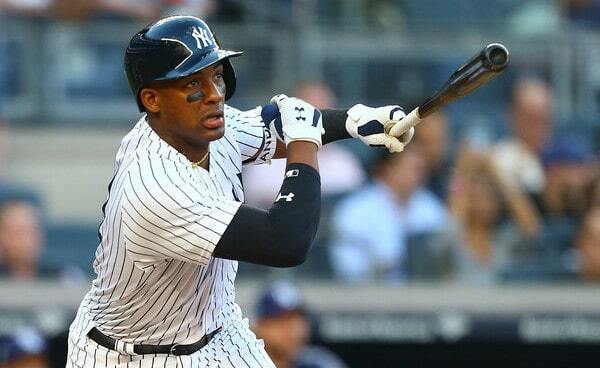 He could be a really good hitter in this league,” said Aaron Boone in September. Cashman gave a more diplomatic “hard to answer on (the) sample size” answer when asked whether Voit is legit. I’ll say this much: I don’t expect Voit to repeat his .333/.405/.689 (194 wRC+) effort going forward. Almost no one does that. Super early 2019 projections have him at .262/.336/.459 (115 wRC+) next year, for what it’s worth. Voit had a 47.3% hard contact rate and a 34.4% ground ball rate with the Yankees. He crushed the ball and he got it airborne. Do that and good things tend to happen, and good things sure happened when Voit was at the plate for the Yankees. His xwOBA, which is based on exit velocity and launch angle and things like that, was right in line with his actual wOBA. Voit was rewarded for the contact he made. He wasn’t living off bloops and grounders with eyes. Given his statistical track record, Voit’s ability to hit the ball extremely hard is very real. Say what you want about exit velocity — I know I’m tired of hearing about it after every batted ball — but you can’t fake it. You can either hit the ball that hard consistently or you can’t. Voit can. He showed the ability to go the other way — his 20.4% opposite field rate with the Yankees was lower than I would’ve guessed — and work counts. They were professional at-bats, as broadcasters like to say. There are two things working against Voit going forward. One, he put up the bulk of those numbers in September, and September has a way of playing tricks on you. Call-ups and teams with nothing to play for — there are a lot of teams with nothing to play for late in the season these days — can skew numbers. And two, Voit won’t catch teams by surprise next year. They’re going to make adjustments and he’ll have to adjust back. Voit’s time with the Yankees was a small sample size to start with. Only 148 plate appearances. Now we’re slicing and dicing it even more, so take this all with a giant grain of salt. Right now, all we know is that in his limited time with the Yankees, Voit hammered right-handed fastballs below 94 mph and struggled to make contact against right-handed fastballs at 95 mph and above. Moreso than the typical righty hitter. Hence the Red Sox pounding him with righty heaters in the ALDS, and his 3-for-13 (.231) showing with zero extra-base hits. Point is, Voit hits the ball really hard and that is a skill you can not teach. He has it and it drew the Yankees to him. Whether he can remain productive outside the pathological liar that is September and once the league adjusts to him remains to be seen. 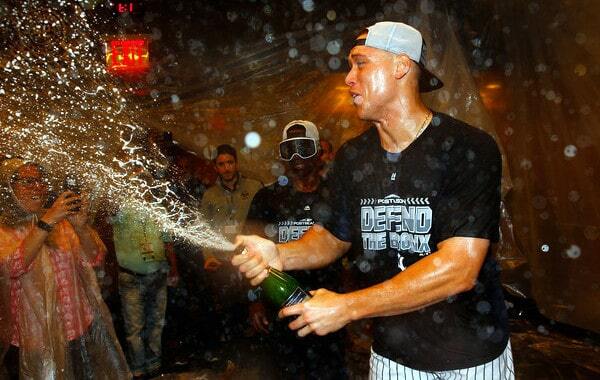 His performance this past season happened and it helped the Yankees win games. There’s no taking it away. The tools are there for Voit to remain productive going forward. Perhaps not that productive, but productive. Now it’s up to him to do it. Both Cashman and Boone stopped short of naming Voit the 2019 starting first baseman during their end-of-season press conferences, which makes sense. No need to declare an uncertain position settled before the offseason. “He certainly came over here and was given that opportunity and took it and kicked the door in. I’m sure there will continue to be competition on all kinds of levels,” Boone said. At the very least, Voit earned a chance to win a big league job in Spring Training. He’s a late-bloomer — Voit turns 28 in February — and the Yankees owe it to themselves to find out whether Voit can be their late-bloomer. Their Nelson Cruz or Jesus Aguilar. Cruz didn’t get his first opportunity as an everyday big leaguer until his age 28 season. Ditto Aguilar. These defensive challenged right-handed bats can get written off quickly. Every so often they surprise. 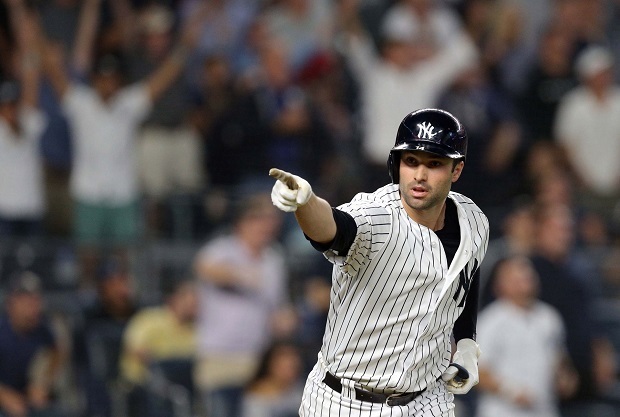 There is a lot of offseason left to go and, even though pitching and a Didi Gregorius replacement are the top priorities, it wouldn’t surprise me to see the Yankees bring in another first baseman. Maybe they’ll go big and trade for Paul Goldschmidt. That’d be cool. Or perhaps they’ll opt for a lower cost pickup to compete with Voit (and Bird?) in Spring Training. Either way, Voit was awesome this year and I expect him to get a chance to prove he can do it against next year. Although the 2018 season had a (very) disappointing ending, it is exciting to look at the Yankees and know they are loaded with young talent for the future. Aaron Judge is a superstar through and through. He’s a top ten player in baseball. Then there’s Luis Severino, Gary Sanchez, Gleyber Torres, and Miguel Andujar. Most teams hope to have two guys like that on their roster. The Yankees have all of them. And yet, going into the 2018-19 offseason, the Yankees are facing some very real questions all around the infield. As recently as June or July it looked like the Yankees were set long-term around the horn, with a young and productive player at all four infield positions. Now, in October, that isn’t really the case. That isn’t to say the Yankees are in bad shape on the infield, because they’re not, but things are a little up in the air. Let’s take a trip through the infield. Since Opening Day 2016 the Yankees have received a .234/.314/.403 (91 wRC+) batting line and +1.9 WAR from their first basemen. Among the 30 teams they rank 26th in AVG, 23rd in OBP, 29th in SLG, 29th in wRC+, and 27th in WAR. Gross. Even with the first base cast of characters combining for 34 home runs (!) in 2018, first base has been wasteland since Mark Teixeira’s last good season in 2015. Right now, it is fair to wonder whether Luke Voit is legit, whether Greg Bird is salvageable, and whether Miguel Andujar is going to wind up at first base. The Yankees love Bird and I’m certain that if you gave Brian Cashman & Co. a truth serum, they’d say they want Bird to grab the job and run with it next year. I would like that too. Bird has power and patience, at least when healthy, and the Yankees could use another left-handed bat. Honestly, I feel like nothing that happens with first base this offseason would surprise me. Stick with Voit? I could buy it. At the very least, he has to be given every opportunity to win a roster spot in Spring Training, right? Right. Stick with Bird? I could see that too. Trade for Paul Goldschmidt? Trade for someone else? I could totally see it. Sign Bryce Harper and put him at first? Eh, that’s a stretch. Point is, first base remains unsettled, even after Voit’s late-season showing. These two positions are tied together because Torres is going to play one of them next year. We just don’t know which one. Gleyber’s a stud, man. A 21-year-old kid hitting .271/.340/.480 (120 wRC+) with 24 home runs as a middle infielder thrown into a pennant race as a rookie is awfully impressive. Torres is a stud and I think we’re no more than two years away from him emerging as the Yankees’ best player. Not because Judge will collapse or anything. Just because Torres is that damn good. The problem here is Didi Gregorius. He had Tommy John surgery yesterday. He’s expected to return sometime next summer but no one really knows when. Could be as early as May or June, or as late as August or September. The Yankees have to proceed as if they won’t have Gregorius next year. Although Tommy John surgery is fairly routine, it is a major surgery, and there could be setbacks or a slower than expected recovery. It happens and the Yankees have to be prepared for it. 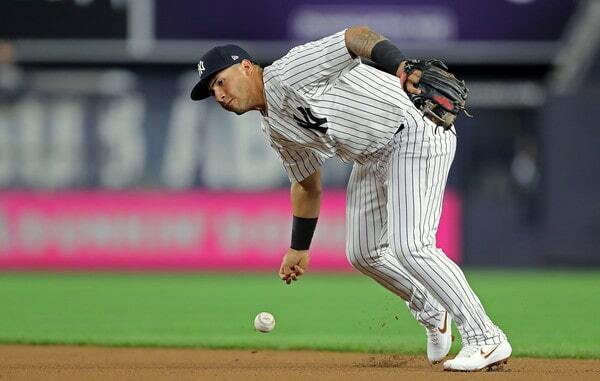 Gleyber is a natural shortstop — I thought he looked way smoother at short this season than second base — and his flexibility allows the Yankees to replace Gregorius with either a shortstop or second baseman. I’d prefer adding another shortstop and leaving Torres at second, but, if the market cranks out better options at second base, then Gleyber moves over. The only question then is who is the backup shortstop? You’d have to dedicate a bench spot — only of three bench spots since the eight-man bullpen seems to be here to stay — to a shortstop capable infielder. We know this much about second base and shortstop: One of these two positions is set. Torres will play one. Cashman said they’ll scour the offseason market for a player at the other position “whether it’s an everyday player or an insurance policy.” In a weird way, Torres is the most “sure thing” among Yankees infielders at the moment, and we don’t even know whether he’s playing second or short next year. We just know he’ll be there. Hmmm. By OPS+, Andujar just had one of the three best seasons by a rookie third baseman in the last 30 years. Kris Bryant (135 OPS+) is kinda out there in his own little world, but Andujar (126 OPS+) is right there with Evan Longoria (127 OPS+). Those are the only three rookie third basemen to best a 125 OPS+ since Kevin Seitzer back in 1987. Andujar had an incredible rookie season. By WAR, Andujar had only the 16th best season by a rookie third basemen over the last 30 years. His +2.2 WAR puts him alongside guys like Gordon Beckham (+2.1 WAR), Akinora Iwamura (+2.2 WAR), and Garrett Atkins (+2.3 WAR). That’s how much value Andujar gave back with his glove. He had one of the best offensive seasons by a rookie third basemen in three decades and was still run of the mill in terms of overall value. The Yankees told use exactly what they think about Andujar’s defense. They subbed him out in the sixth inning (!) for defense in the postseason. When it mattered most, the Yankees didn’t trust Andujar in the field, and I don’t really blame them. Range is a clear issue, and while Andujar has a strong arm, it plays down because his transfer is slow and his sidearm sling can cause the ball to sail wide of first. For what it’s worth, earlier this week Cashman said during a radio interview that he expects Andujar to be the team’s third baseman next season. Of course he’s going to say that, right? The Yankees could be planning — and already enacting — a position change and they would still say they want Andujar at third base because it allows them to maintain leverage during trade and free agent talks. I am weirdly ambivalent about Andujar’s defensive home next season. If the Yankees decide to keep him at third base for another season and let him work at it, I’m cool with it. And if the Yankees decide to move him to first base or left field (or DH), I’d be cool with that too. Ryan Braun had a great rookie year overall but was a defensive disaster, so he was moved to left field the next season. Could happen with Andujar! Maybe this is a fluid situation. The Yankees might be planning to put Andujar at third base next season, but, if a better option comes along (trade for Nolan Arenado? ), they’ll move him. Otherwise they’ll stick with it at least until Gregorius returns, then they can reevaluate their infield situation and figure out the best alignment. It could be that whoever replaces Didi plays well enough to stay in the lineup everyday, pushing Andujar somewhere else. We’ll see. The good news is the Yankees are not devoid of infield talent. There are worse things in baseball than having Miguel Andujar as your starting third baseman, you know? Torres is a stud. Voit raked this year — maybe he is the Yankees’ Nelson Cruz or Jesus Aguilar? that late bloomer who finds it in his late 20s? — and Bird could still maybe be something. They have to replace Gregorius at least temporarily, for sure. A Didi replacement is a “must have” this winter. At the same time, Voit may be more Shane Spencer than Cruz or Aguilar, and play his way to Triple-A. Andujar could struggle defensively again. I don’t see how you could count on Bird for anything. The Yankees don’t necessarily have an infield problem. They just have some things to sort out. Is Andujar the long-term answer at third? Is it time to bring in a veteran first baseman to stop the post-Teixeira revolving door? Who steps in for Gregorius? Those are all questions the Yanks will answer this winter. This morning was the deadline for the Yankees and Red Sox to submit their 25-man ALDS rosters to MLB, and, shortly thereafter, the two clubs announced them officially. Yesterday Aaron Boone more or less confirmed the entire roster and it is as expected. No surprises. The Yankees dropped Kyle Higashioka and Tyler Wade from their Wild Card Game roster and added Sabathia and Tarpley. They’re carrying four starters, eight relievers, and a four-man bench. Normally, eight relievers in a postseason series is overkill, especially since they’re not going to play more than two days in a row. Yanks vs. Sox games tend to get wild though. The extra reliever could come in handy. The five-man bench: Gardner, Hechavarria, Romine, and Walker. It’s worth noting Gardner (left field), Hechavarria (third base), and Walker (first base) all came in for defense in the late innings of the Wild Card Game. I wonder if that will continue to be the case going forward. I guess it depends on the score. The Yankees might hold Gardner back for a pinch-running situation in a close game. We’ll see. Middle relief has been a season-long problem for the Red Sox and they’re going to try to patch that up with Rodriguez this postseason. Also, Eovaldi was told to prepare to pitch in relief in Game One. Wright is a starter by trade as well. Red Sox manager Alex Cora was the Astros bench coach last year, when they expertly used starters like Lance McCullers, Brad Peacock, and Charlie Morton in relief in the postseason. I suspect he’ll look to do the same with the Red Sox this year. ALDS Game One begins tonight at 7:30pm ET. As expected, the Yankees and Red Sox games drew the primetime slots. All five ALDS games will begin somewhere between 7:30pm ET and 8:10pm ET. The entire series will be broadcast on TBS. For all intents and purposes, the AL East race ended in early August. The Yankees went up to Boston, got swept in four games — they were outscored 28-13 in the four games — and fell 9.5 games behind the Red Sox. That was it. The Yankees never again drew closer than six games behind Boston. The Red Sox took care of business that series and were able to coast the rest of the way. Starting tomorrow though, the slate will be wiped clean, and the Yankees and Red Sox will go into the ALDS on a level playing field. No deficit to make up in the standings. First to three wins moves on to the ALCS. Given how close these teams usually play — even with that four-game sweep, the Red Sox only won the season series 10-9 — it would not surprise me at all if the ALDS goes the full five games. Aaron Judge had just been placed on the disabled list with his wrist fracture. Gary Sanchez was on the disabled list with his second groin strain. J.A. Happ was on the disabled list with hand, foot, and mouth disease. Given Luis Severino’s second half struggles, you could argue the Yankees went into that series without their best starting pitcher. (Chance Adams had to fill in, which he did admirably.) The Yankees definitely went into that series without their best hitter. And while Sanchez had a terrible season, he tends to rake in Fenway Park, and the Yankees were without him as well. When the ALDS opens tomorrow night, the Yankees will have Judge and Sanchez in the lineup, and chances are Happ will be on the mound in Game One. Furthermore, Andrew McCutchen and Luke Voit will be in the lineup. McCutchen was not a Yankees when these two clubs met in August. Voit was a Yankee and he did appear in two games in that series, but he was still Luke Voit and not American Hero Luke Voit at the time. The Red Sox have a left-handed heavy pitching staff — Chris Sale and David Price are starting Games One and Two, the club announced — and the Yankees will now have four premium righty bats in the lineup that they did not have in August. Three if you’re really down on Sanchez. McCutchen replaces Brett Gardner, Judge replaces the Neil Walker/Shane Robertson platoon, and Voit replaces Greg Bird. Considerable upgrades all around. I should note this goes beyond platoon matchups as well. McCutchen, Judge, and Voit all mash left-handed pitchers — Sanchez does as well, he had a .229/.354/.518 (136 wRC+) line against southpaws this season — but they’re also better against righties than the guys they replaced. McCutchen’s a much better hitter than Gardner. An inferior defender? Yes, but the decline in defense is more than made up by the increase in offense. Going from Walker/Robinson and Bird to Judge and Voit is just a massive upgrade. Massive. The Yankees will also have Happ on the mound, presumably in Game One but also possibly in Game Two. Happ is one of the few starting pitchers who consistently pitched well against the Red Sox this year. Just last week he carved them up for five innings before giving up what amounted to a garbage time grand slam to Steve Pearce in the sixth inning. Happ made four starts against Boston this year and three times he allowed no more than one earned run. Four times in six September games the Yankees beat the Red Sox, and while that feels good, it doesn’t mean a whole lot. The BoSox had nothing on the line in any of those games, especially in that final weekend, and they never really seemed to give the Yankees (or anyone) their best effort in September. They earned that. They had a huge division lead and were able to rest their regulars and audition others for the postseason roster down the stretch. These two teams last played a meaningful series in August, in that four-game sweep, and the team the Yankees take into the ALDS is going to look much different than the team they sent to Fenway Park in August. McCutchen and Voit are big upgrades over Gardner and Voit, Happ is healthy, Judge is healthy, and Sanchez is healthy too. Right now, the Yankees match up better against the Red Sox than they did at any other point in 2018. With four days to go in the 2018 regular season, we know one thing for certain: The Yankees will play the Athletics in the 2018 AL Wild Card Game next Wednesday. The game will likely be played in Yankee Stadium, though that is not set in stone yet. The magic number for homefield advantage in the Wild Card Game is two. The Yankees-Athletics matchup is set though. The Wild Card Game is its own postseason round. The Yankees and A’s will set a 25-man roster for the Wild Card Game, then whichever team advances will be able to set a new 25-man roster for the ALDS. Because of that, we’ve seen some funky wildcard rosters in recent years. 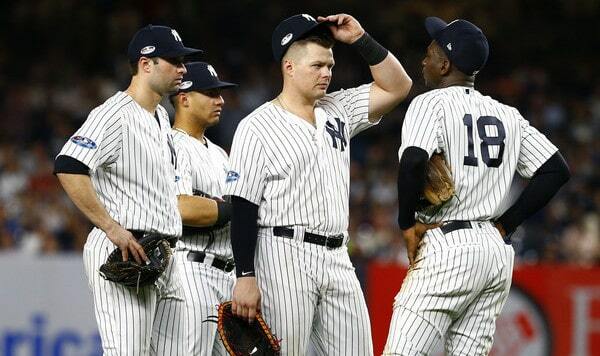 The Yankees carried only nine pitchers on their 2015 Wild Card Game roster. Last year they carried ten. That means a great big bench. So, with the Wild Card Game now only six days away, this is as good a time as any to try to piece together the 25-man roster the Yankees will carry next Wednesday. It’s a bummer the Yankees are going to finish with 100-ish wins and have to play in a winner-take-all Wild Card Game, but hey, if you don’t like it, win more games. Let’s dig into the potential Wild Card Game roster. I was initially on the fence about Hechavarria, but the more I thought about it, the more I realized he’s going to make the Wild Card Game roster. Worst case scenario is he serves as Andujar’s defensive replacement. The rest is pretty straightforward though, right? Right. We still have eight roster spots to fill, so let’s get to it. Didi Gregorius is out with torn cartilage in his right wrist and he could play in games before the end of the season. He got the okay to resume baseball activities yesterday, so that’s good. If he’s able to play this weekend and has no problems, he’ll be on the Wild Card Game roster. If not, it opens up the possibility for Ronald Torreyes to make the roster. The Gregorius/Torreyes spot is our 18th player. Aaron Hicks, meanwhile, has a tight left hamstring and is day-to-day. He too could play before the regular season ends, and, if that happens, he’ll be on the Wild Card Game roster as well. If Hicks can’t play in the Wild Card Game, I think Tyler Wade makes it instead. Wade can play the outfield, if necessary, but more importantly he can run. No Hicks on the roster means Gardner is in center field rather than on the bench as a pinch-running option. With Hicks out, Wade becomes the pinch-runner. The Hicks/Wade spot is our 19th player. We still don’t know who will start the Wild Card Game. Aaron Boone has indicated the decision could come soon and he’s made it pretty clear it’ll be either J.A. Happ, Luis Severino, or Masahiro Tanaka. The Yankees aren’t going to do a straight bullpen game. Two weeks ago RAB readers wanted Tanaka to start the Wild Card Game. I think the Yankees want it to be Severino. Happ is a perfectly fine candidate as well. At the moment Happ is lined up to start the Wild Card Game on normal rest and Tanaka with two extra days of rest. 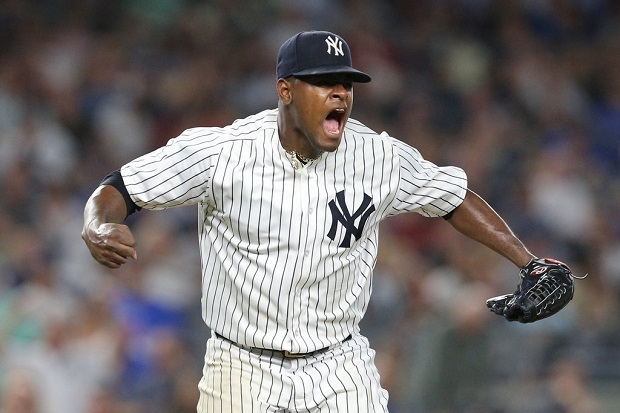 Severino would be on three extra days of rest, though he could wind up starting Game 162 should the Yankees need to win that game to clinch homefield advantage. Hopefully it doesn’t come down to that. Based on the way things are set up now, all three guys will be available to start the Wild Card Game. That’s not an accident. The Yankees made sure they had options. An emergency guy for extra innings. An emergency emergency guy in case there’s an injury or things really go haywire. It is entirely possible Happ, Severino, and Tanaka will all be on the Wild Card Game roster even though only one guy is starting the game. Or it’s possible Happ and Severino are on the roster with Lance Lynn, who has bullpen experience, replacing Tanaka. 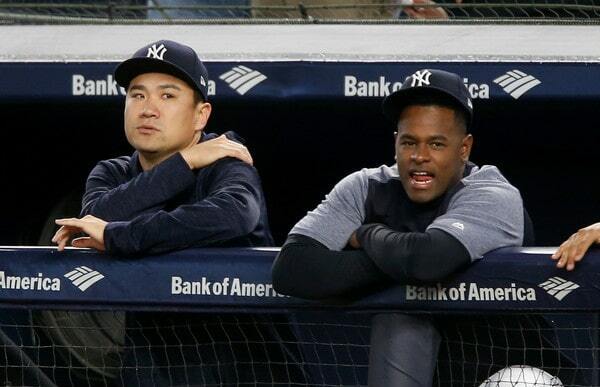 I don’t think the Yankees would carry Sabathia as a reliever at this point, but it can’t be ruled out. Gray? Eh. Seems like a worst case scenario. I suspect that, unless he has to start Game 162 on Sunday, Severino will be on the Wild Card Game roster. Even if he doesn’t start the Wild Card Game, he could be another bullpen option. Heck, he might be on the roster even if he starts Game 162. The Wild Card Game would be Severino’s throw day and he could give you an inning or two out of the bullpen. Yeah, one way or the other, I think Severino’s on the roster. He’s our 20th player. My hunch is both Happ and Tanaka will be on the roster as well. I was thinking maybe the Yankees would carry Lynn instead of one of those two because he has bullpen experience, but I keep going back to Brian Cashman saying it is “all hands on deck for that one game,” and Happ and Tanaka are objectively better than Lynn. The bullpen experience is nice. I don’t think it trumps effectiveness. Happ and Tanaka are the 21st and 22nd players (and eighth and ninth pitchers) on our roster. Whoever starts the Wild Card Game, that guy will be on a very short leash. It could devolve into a bullpen game rather quickly. For both teams. Because of that, I think the Yankees will carry ten pitchers on the Wild Card Game roster like last season, rather than nine like in 2015. I wouldn’t rule out an 11th pitcher, honestly. I’m going to stick with ten though. That seems like plenty for a one-game scenario. With Happ, Severino, and Tanaka joining the six late-game relievers, we are left with eleven candidates for the final pitching spot: Gray, Lynn, Sabathia, Chance Adams, Luis Cessa, A.J. Cole, Domingo German, Tommy Kahnle, Jonathan Loaisiga, Justus Sheffield, and Stephen Tarpley. I think we can rule out Adams, German, Loaisiga, and Sheffield right now. They would’ve gotten a longer look this month if they were Wild Card Game candidates. Tarpley has gotten some run lately as a left-on-left guy and the other night Boone told Erik Boland that Tarpley has put himself “in the conversation” for the Wild Card Game roster. Since his ugly big league debut, Tarpley has thrown 5.2 scoreless innings with seven strikeouts, and lefties are 1-for-11 (.091) with five strikeouts against him. In the minors this year Tarpley held left-handed batters to a .141/.213/.183 line with a 29.4% strikeout rate. Really good! There is one reason to carry Tarpley on the Wild Card Game roster: Matt Olson. Oakland’s lefty swinging first baseman went into last night’s game hitting .247/.338/.496 (128 wRC+) against righties and .251/.329/.369 (96 wRC+) against lefties. He’s someone you can LOOGY. That said, if you bring in a lefty for Olson, A’s manager Bob Melvin will counter with righty swinging Mark Canha, who’s hitting .274/.331/.596 (148 wRC+) against southpaws. Melvin’s been doing it all year. In a high-leverage situation — is there such a thing as a low-leverage situation in a game as important as the Wild Card Game? — I’d rather have one of the regular late-inning relievers facing Olson than Tarpley facing Canha. All the late-inning guys have good numbers against lefties. I have a hard time envisioning a scenario in which Tarpley faces Olson/Canha in the middle (or late) innings rather than one of the usual late-inning guys. Worrying about the platoon matchup there seems like paralysis by analysis. Overthinking it. … but that was 2017 Tommy Kahnle. 2018 Kahnle is not 2017 Kahnle. 2017 Kahnle would be on the Wild Card Game roster no questions asked. 2018 Tommy Kahnle? Nah. So we’re left with Lynn, Sabathia, and Tarpley. So maybe it will be Tarpley? Either way, we’re talking about the last guy in the bullpen, someone who won’t pitch in the Wild Card Game unless things go really crazy. I’d take Lynn. Tarpley has a shot. Whoever it is, this is our tenth pitcher and 23rd player on the roster. The big name bench candidate is Bird. We know Voit is starting at first base in the Wild Card Game, even against a right-handed pitcher. He’s been too good and Bird’s been too bad. The question is this: What would Bird provide the Yankees? A backup first baseman and a lefty bench bat who could take aim at the short porch? Sure. But Walker could do that too, and Bird offers zero defensive versatility. Then again, if Gregorius is unable to play in the Wild Card Game, Walker would presumably start at second base — it would be either Gleyber at short and Walker at second, or Hechavarria at short and Gleyber at second — thus leaving the Yankees without a backup first baseman/lefty bat on the bench. Given his performance, leaving Bird off the Wild Card Game roster would be completely justifiable. I still think he’ll be on. The Yankees love him and they have the spare bench spots. I hereby declare Bird our 24th player. Don’t dismiss Higashioka as a Wild Card Game roster candidate. 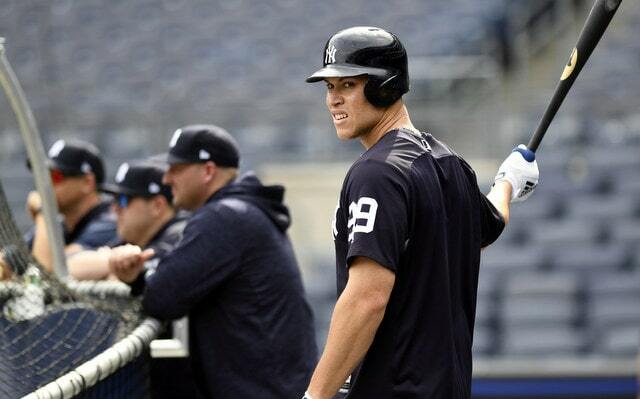 His presence would allow the Yankees to pinch-run for Sanchez without worrying about Romine potentially getting hurt. Or they could pinch-hit for Sanchez in a big spot. I wouldn’t do it and I don’t think the Yankees would, but it would be an option. The Yankees only had two catchers on the roster last year because Sanchez was the man and he wasn’t coming out of the game. They did carry three catchers on the 2015 Wild Card Game roster though (Sanchez, Brian McCann, John Ryan Murphy). Gregorius and Hicks are both hurt: Torreyes and Wade both make it, and the Yankees carry either Higashioka or an 11th pitcher. Only one of Gregorius or Hicks is healthy: Ten-man pitching staff, Torreyes and Wade both make it. Gregorius and Hicks are both healthy: Ten-man pitching staff, only one of Torreyes or Wade makes it. If both Gregorius and Hicks are healthy — and we all hope that is the case — I think Wade makes the Wild Card Game roster over Torreyes because he’s more versatile and his speed could really come in handy in a late-inning pinch-running situation. If both Gregorius and Hicks are both hurt, the Yankees are kinda stuck. It’s either Higashioka or an 11th pitcher at that point. The position player side of the Wild Card Game roster is going to depend on the health of Gregorius and Hicks. On the pitching side, the Yankees can pick and choose who they want. We know the six end-game relievers will be there. The Yankees are likely to carry three starters, no matter who they end up being. Do they carry Tarpley? That might be the most interesting Wild Card Game roster question. For at least one day, the Yankees staved off an embarrassing AL East championship watch party in the Bronx as they rallied for a 3-2 victory in Tuesday’s series opener. The Yankees won despite just three hits, the second time this season they’ve pulled off that feat at Yankee Stadium (the other game was September 1 vs Detroit). The last time they won multiple home games with no more than three hits was 1998. Before we get to the late-game dramatics, let’s recognize the gutty performance of J.A. Happ, who pitched out of several jams while holding the Red Sox to one unearned across six innings. Happ has a 0.54 ERA in three starts against the Red Sox this season; that’s the lowest ERA by any AL pitcher against any opponent this season (min. 3 starts and 10 IP). Down 1-0 in the seventh with two men on base, Neil Walker snatched the hero’s cape as he drilled a 3-2 pitch from Ryan Braiser into the second deck in right field, flipping the score for a 3-1 advantage. It was his third go-ahead homer in the seventh inning or later, the most by any Yankee this season. It was the team’s 18th go-ahead home run in the seventh inning or later, the second-most in a season in franchise history, trailing only the 2009 club (21). That blast was also Walker’s 10th of the season as he became the 11th Yankee to reach double digits in 2018. That ties the major-league record, done by four other teams: 2017 Astros, 2016 Twins, 2015 Astros and 2004 Tigers. The Yankees kept Boston’s celebratory champagne corked for a second night in a row, routing their rival 10-1 on Tuesday. Also, significant is the fact that it kept the Red Sox at 103 wins with 10 games remaining, so that they won’t be able to match the 1998 Yankees 114-win season. Miguel Andujar jump-started the dinger parade early with a homer in the second inning to put the Yankees up 1-0. It came on a 1-2 pitch from Price, his 12th homer when behind in the count, which leads all major-league players this season. The solo blast was also his 25th of the season, giving the Yankees a MLB-best four players with at least 25 homers this season. Even more impressive is Andujar’s nearly unprecedented combo of two-baggers and longballs this season. He is one of five AL rookies, aged 23 or younger, to hit at least 25 homers and 40 doubles. The other four: Nomar Garciaparra (1997), Ted Williams (1939), Joe DiMaggio (1936) and Hal Trosky (1934). And he is the only rookie third baseman (at least 50% of games played at the position) in MLB history to reach those totals in a season. It finally happened. 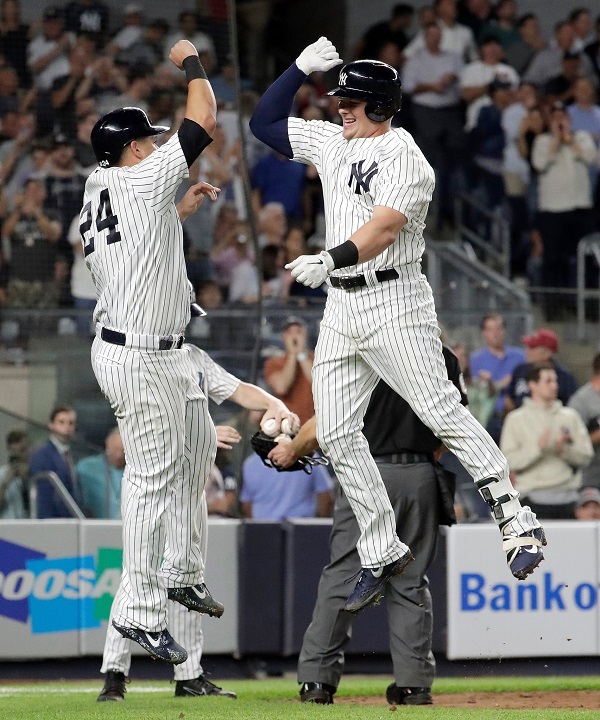 Needing a sweep to prevent a cruel division-clinching party by their blood rival at The Stadium, the Yankees snatched defeat from the jaws of victory as they allowed the Red Sox to rally late for a 11-6 victory. This is the Red Sox 10th AL East title in the Divisional Era (since 1969) and the first time they’ve clinched it with a win against the Yankees. 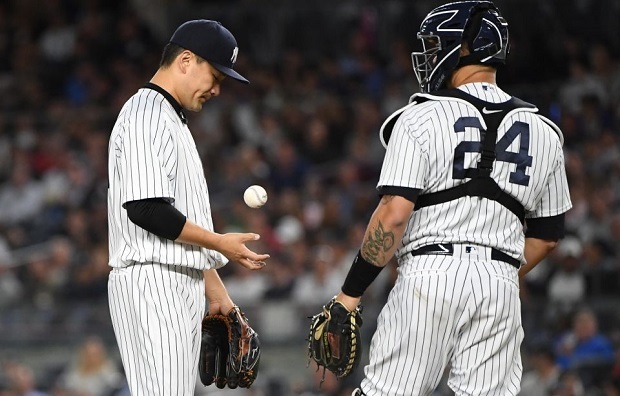 Masahiro Tanaka, coming off back-to-back scoreless outings, was hit hard by the Red Sox lineup early and often, giving up four runs in the first three innings and got the hook with no outs in the fifth. This continued a string of poor performances against the Red Sox this season: in four starts, he has a 7.58 ERA with 29 hits and six home runs allowed over 19 innings pitched. With one swing of the bat in the second inning, Luke Voit set two home run records when he bashed a 93-mph pitch deep over the center-field wall. It was his 10th homer in pinstripes and he became the 12th Yankee this season with double-digit dingers, the most such players for any team in MLB history. The two-run blast was also the Bombers’ 246th home run in 2018, setting a new single-season franchise record. As mentioned above, that advantage lasted only a couple innings as Chad Green surrendered a game-tying homer to Jackie Bradley Jr leading off the seventh. Green has allowed nine homers in 71 2/3 innings this season; entering 2018, he had given up four homers in 76 1/3 career innings as a reliever. Dellin Betances tried to clean up Green’s mess in the seventh, but after loading the bases, he coughed up a tie-breaking sac fly to Xander Bogaerts. It was the first sac fly allowed by Betances in more than two years (August 30, 2016 vs Royals).